Janet L. Cannon is a technology instructor for the public schools and also enjoys educating people of all ages in world music and a variety of obscure crafts. Editing newsletters, blogging, acquiring science fiction and fantasy manuscripts for Walrus Publishing, networking on social media, presenting, freelance editing, and working with her critique group all carve out time from writing, but those are all pieces of the success platform she’s building. She is active with both the state and local writers’ guilds. Her publishing credits include a technical manual, short stories, flash fiction, and Twitter fiction. With a BA and an MA in English, she hopes one day to use them to publish the next best-selling YA urban fantasy series. 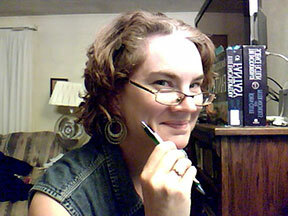 Her literary blog, revisionisadishbestservedcold.blogspot.com features weekly articles on how the metaphors of speculative fiction revise our view of the world, interviews with authors, and reviews on a variety of books. You can contact her at janetcannonwriter@gmail.com and find her web page at http://janetcannonwriter.wix.com/in-the-write-world. If you haven't done so already, check out Janet's award-winning story "Elevator Pitch" and then return here for a chat with the author. WOW: Congratulations on placing in the Spring 2014 Flash Fiction Contest! What was the inspiration for your short story, or what prompted you to write this particular story? Janet: At one of the writing conferences I attended, the hotel was also hosting a beauty pageant for young girls. Glitter and empty Pixy Stix wrappers littered every floor, and screaming three-year-olds raced down the hallways at two o'clock in the morning. I ended up missing half of Saturday's events because of a migraine due to lost sleep from said screaming children, including a presentation I was supposed to give and awards I was supposed to receive at the banquet that night. Needless to say, that was one of the most miserable conference experiences I've ever had. The second part of the story--being caught in the elevator with your ideal agent--is the pipe dream (or nightmare) of most writers. I figured pairing these two events would make for a fun story. WOW: Glad to know that you got something positive—your award-winning story—out of a bad conference experience. What do you enjoy the most and/or the least about writing? Janet: My favorite part is the creation of the story. When my characters are truly alive they do things I don't expect. I love it when they surprise me and the story takes on a life of its own. The most difficult part is revision. I don't dislike it, but I have high standards. When I send something off, I want it to be as close to perfect as it can be. I may spend too much time worrying about details, having editors or beta readers give me feedback, etc., but my stories represent me and I want my reputation to reflect me in a positive light. There are a couple of errors in this story that irk me, but no one is perfect. I can always revise for next time! WOW: I love your up-beat attitude! Do you have any strange writing habits? I have a bottle of scented moisturizer by the computer because I hate typing with dry hands. Sometimes I use aromatherapy to trigger certain emotions or calm myself down after writing a particularly difficult scene. I have to take off all my jewelry except my wedding ring: earrings, bracelets, and necklaces bother me to the point of frustration. WOW: Thank you for that insight into your writing life. I love the behind-the-scenes details of writers’ lives. In a previous interview, you mentioned you were working on a “YA Urban Fantasy novel Shadow of Redemption, a story where the Big Bad Wolf and the Monster Under the Bed are good guys.” How’s that project going? Janet: Right now, it's in the "simmer on low" stage. As much as I would love to hop right in and rip and revise it into shape and start querying it out, my work schedule won't permit me to do so. And as I said earlier, I don't like to send out shoddy work. I've read through my editor's comments, read through my critique group's comments, and I'm thinking about where to cut, where to expand, and plotting the demise of several sections that don't quite belong. It's going to be a painful process when I get to it, but just like making bread, sometimes you have to let the yeast do its work to make a better tasting loaf. WOW: I like the analogy! What are you reading right now, and why did you choose to read it? Janet: I'm reading/content editing a manuscript for a client who is going to self-publish in the fall. He's done a great job of self-editing and he's already sent it through a line editor, so all I'm doing is giving him a few last-minute suggestions. I'll be helping him promote the book when it comes out. As for fun reading, I'm finishing off Donna Tartt's The Goldfinch (chosen by my ladies' lit circle) which is beautifully crafted but I can't say it's the best book I've ever read. I appreciate the craft but the story doesn't intrigue me. Next up is either Heather Brewer's Eighth Grade Bites or Angie Fox's Accidental Demon Slayer because I saw them speak at an event and they were both marvelous! WOW: Thanks for the recommendation! Anything else you’d like to add? WOW: Thanks so much for your responses, Janet! Happy writing!